This is the column that explains how I got the bowling ball I gave away—or, rather, tried to give away—in the Saturday Fun Activity. What stands out for me upon re-reading is how different the media landscape is today compared to 20 years ago. I can't imagine a publicist calling up and trying to get me to go to a party with a Hollywood actress—it sounds like something out of "The Sweet Smell of Success." The Goat is more of a tourist trap than journalist hang-out, or so I'm told. Men are idiots. I almost said "Women make men idiots." But why blame them? They're merely being women, doing womanly things: lounging on red velvet chaises, brushing their long, golden hair, striding smartly about their business in those sharp suits. It's not their fault. It is men, weak in the presence of beauty, who do it to themselves. Who, in their infinite capacity to believe in their own imagined splendor, stride into light posts while straightening their ties in store windows. Particularly married men. I almost said "Even married men," but that also understates the case. To be married is, among other things, to be out of practice. Out-of-circulation, pickled in the brine of domestic bliss. The rare moments you are dragged out into the light of unfamiliar feminine society, well, you make mistakes. You head down into the basement to get your old bowling ball. . . . But I am getting ahead of the tale. It begins like this: I was sitting at my desk, minding my own business, when the phone rang. A publicist calling with—surprise, surprise—an opportunity. Usually I dispose of such calls in about five seconds. But this opportunity was a little different: a pretty young actress, Jennifer McShane, is in town, shooting a movie with Keanu Reeves. Would I like to meet her? They were having a party for her at a swell downtown spot Saturday night. "That sounds like fun . . ." I said, Jiminy Cricket pulling on my sleeve. "But I had better not." I had never heard of Jennifer McShane. I had no burning desire to write about the difficulties of filming a big-budget Hollywood movie. And yet . . .
"Maybe we could set up something else up, then," the publicist suggested, and I felt myself weakening. I tried to think of some ridiculous, unromantic, neutered activity to invite the budding thespian to and came up with a doozy: "How about bowling?" I blurted out. The publicist said yes—publicists invariably say yes—and hanging up the phone I heard the reverberating gong of doom sounding in the distance. This was a bad idea. Embarrassment was afoot. I hadn't gone bowling in about 15 years. My last game, if I recall, I managed an 80. True, this young woman, judging from the 8-by-10 the publicist sent over, was a slight thing, willowy and undernourished. But there was a certain athleticism about her. Maybe she could bowl. I considered rolling a few practice games to sharpen my form. I swung by the AMF lanes at Marina Towers to get the lay of the land. I knew the lanes were there, in theory, but wanted to visually confirm it beforehand. It was like we were going on a date or something (you might want to take this moment to reread the first sentence of this column). I had forgotten that one of the many advantages of being married is you never have to meet unknown women at bowling alleys. I had forgotten how nerve-racking that could be and now was being reminded. Of course I told my wife about the rendezvous. God bless her, she was jealous. While the tabloids are not filled with tales of young actresses falling head over heels for the bowling flair displayed by endomorphic newspaper reporters who bear a passing resemblance to the Bob's Big Boy character at the age of 40, my wife—perhaps infected by my delusional view of the world—was worried about me being plucked away and ending up poolside in Hollywood, some actress's plaything. 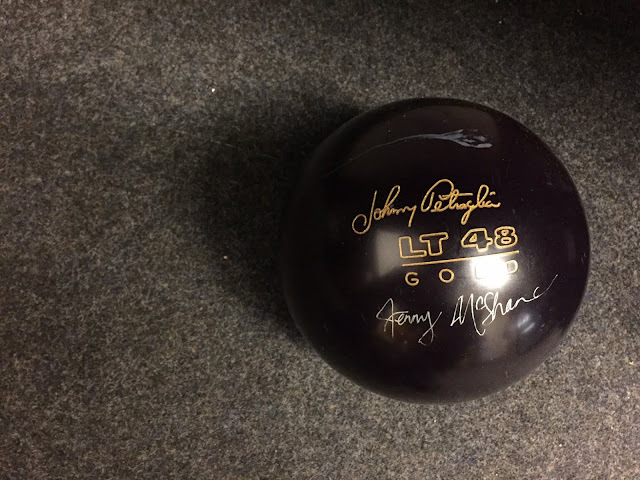 I planned to use my own bowling ball, purchased when I was a teenager. That'll impress her! I was heading down to the basement to retrieve my "Golden Knight" ball, a relic of my misspent teenhood, when my wife offered up a vital bit of helpful advice. "Why not just rent a ball?" she said. "Why lug it?" I paused, thinking, perhaps for the first time, and took her advice. Later that day, the publicist called. Bowling might be a problem, she said, schedulewise for Jenny. I leapt at the opportunity to reverse my folly: "Fine, fine," I said. "Bowling is a mistake. Let's meet at the Billy Goat instead. We can have a beer and talk about acting." At 5:15 I got up from my desk, announced that I was going to the Goat to meet a starlet and left the office. I don't write about the Billy Goat much—a very good columnist who is no longer with us already staked out that territory—but it is a nice place to sit and have a beverage. Like the basement of a crazy Greek uncle with a lot of friends. I took a table by myself, facing the door. The clock ticked. Every time someone came in, I looked up, expectantly. A few friends happened by, and we got to talking. I told them I was being stood up by the star of "Cyborg Cops 3." Finally, about 6:30, I abandoned hope. "OK, guys," I said. "I'm leaving. If any starlets come by, tell them they missed me." I walked out, thankful to be going home, and even more thankful not to be dragging around that bowling ball. But Neil, you forgot to explain how you ended up with a bowling ball signed by the starlet. Ah right. The day this ran, McShane and her publicist showed up at the paper with the ball, as a token of apology. I wasn't in, alas. It's been rolling around on the floor of my office for the past 18 years. I sometimes keep my foot on it as I write. Maybe I should keep it. That's a great story, Neil! I remember my youth, I remember alcohol, I remember bowling, I remember being an idiot. I'm pretty sure I was normal. Good to know you were too. Drill a hole all the way through it & hang it from a rope in your garage to tell you where to stop when you park. Hmm... That's a funny image you've conjured, but I just bought a new truck, so it ain't gonna happen anytime soon. Too funny about you ending up as some actress' plaything. Good column, but meh, I never got the Billy Goat thing. A dive with bad food and surly service, beloved by Mike Royko for some reason. On the scale of male idiocy , Neil is a mere piker -- I'm sure I'd still be waiting for Jennifer way past 6:30. Great story, however. And how is Ms. McShane doing these days? I wonder how Ms. McShane felt about meeting a newspaper columnist at a bowling alley. Perhaps she was a little apprehensive as well, could be why it was called off.